And you thought home ownership was going to be easy! Humorous look at being a handyman fixing leaks and other problems in the house. This repairman and do it yourself man is in trouble big time trying to fix a leak with the toilet in the bathroom. 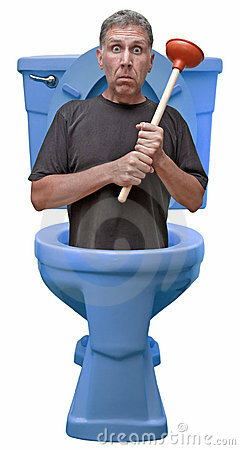 Maybe this guy should hire a plumber since he's one flush away from going down the drain. His plumber (plunger) helper isn't giving him much help, I don't think he can repair anything. Isolated.